I caught the bus to work the other day. This gave me the chance to approach the castle from the public side. 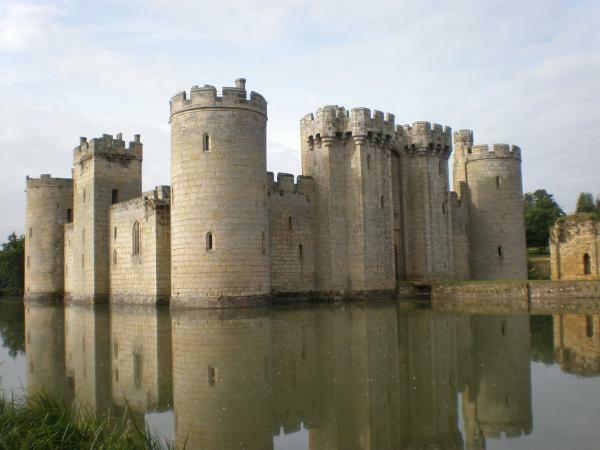 I thought ‘what this most photographed of English castles needs is another set of pictures’. So I did it. The official justification for the building of the castle was the defence of coast. 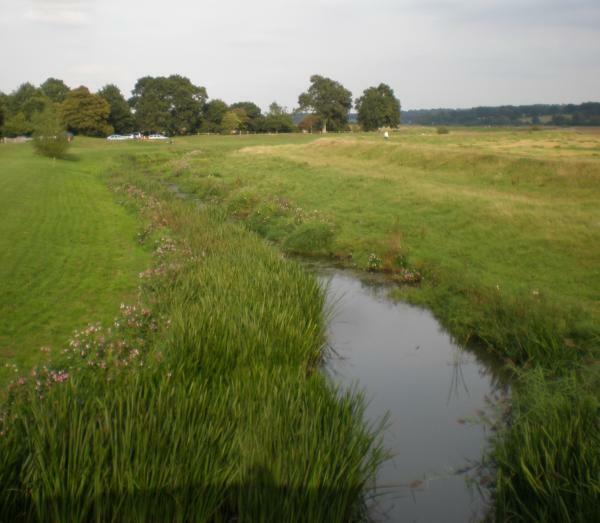 The River Rother (above) would have been wider then. The sea was closer in 1385 – when Sir Edward Dalyngrigge received his Licence to Crenelate from Richard II – and sea-going vessels could sail up to the wharf here. Winchelsea and Rye had been attacked in previous years. 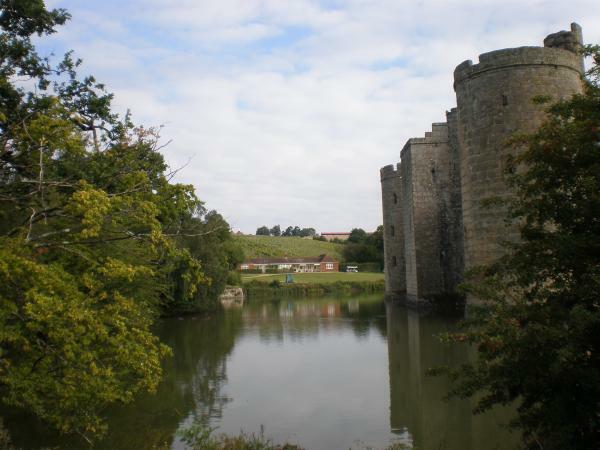 The castle comes into view as you climb up from the mill pond. The path takes you around the site of the old mill pond (Lord Curzon, who owned the castle between 1917 and his death in 1925, thought that it was the old tilting field where jousts were held). The squat brick structure is a Second World War pill box. 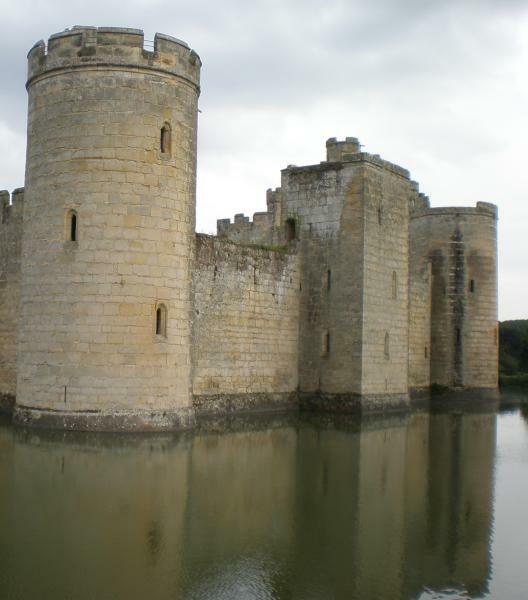 It was built to defend Bodiam Bridge against a German invasion. The Northern parapet of the bridge was removed to give the soldiers a clear line of fire. The South range is the first to come into view. 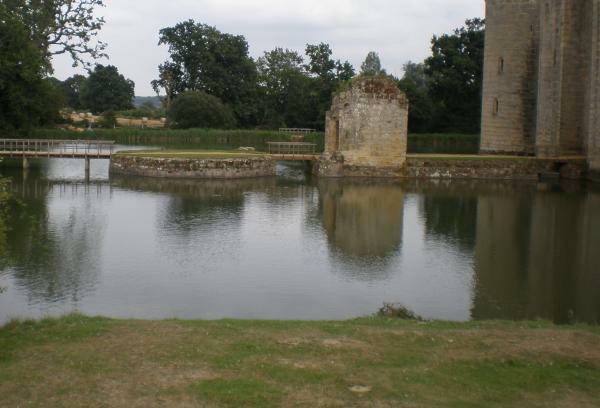 A bridge would have crossed the moat here to the Postern Gate. Curzon discovered the stone foundations of the bridge (including a drawbridge) when he drained the moat in 1919. To the right of the central postern tower is the large window of the Great Hall. A closer view of the postern tower. It is topped by some impressive machicolations. Between the two windows are a jousting helm and three shields. The two outer shields are blank but the central, tilted shield shows the arms of Sit Robert Knolles. Knolles was Dalyngrigge’s military mentor and a key figure in the Hundred Years War. Above the shield is a carved ram’s head jousting helm – also associated with Knolles. Knolles is reputed to have been feared by the French. Perhaps the inclusion of his insignia is a tribute to the man and a discouragement to potential French raiders. The postern had its own portcullis and still has a set of ‘murder holes’. A climb to the top of the tower rewards you with great views of the river valley across to the Kent and East Sussex railway. The East range contains the finest residential apartments (the Lord’s and Lady’s apartments). The large window to the right is the Chapel’s East window. 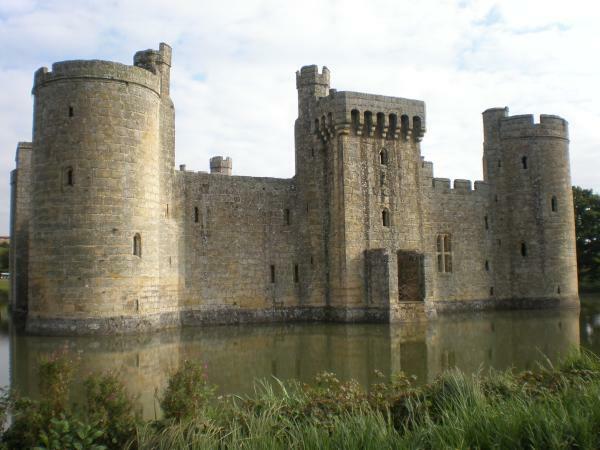 As you cross the moat’s overflow the North range, with its massive gatehouse, comes into view. The gatehouse is topped with more machicolations. The remains of the barbican can be seen to the right. There would have been a drawbridge of some sort between the barbican and the castle. A closer view of the barbican and octagon. The barbican was a two storey mini-fort with its own portcullis. The link to the octagonal island would have been a drawbridge. The octagon had a crenelated wall and a garderobe. Another view of the Northern range. 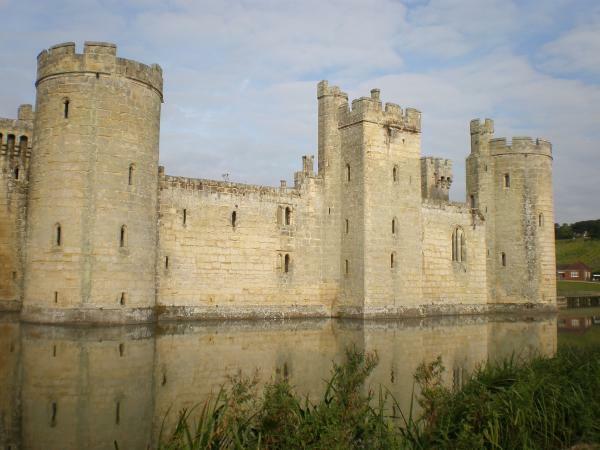 The gatehouse portcullis has been carbon dated and is over 600 years old – it’s the original. Above the gate are the coats of arms of the Wardeux (Dalyngrigge’s wife Elizabeth’s family), Dalyngrigge and Radynden. The Dalyngrigges had a habit of marrying well and an ancestor had married into the prestigious Radynden line. Above the shields is a jousting helm mounted with a unicorn – Dalyngrigge’s chosen mark. The current bridge runs straight from the octagon to the bank. The original ran from this abutment across in front of the battlements. The original wooden foundations were revealed by Curzon in the 1919 draining. In theory the indirect line would have given archers a broadside shot at any attackers who would be slowing to take the right angle turn. There was a drawbridge at the abutment end of the bridge. The abutment itself was crenelated which seems strange from a defensive point of view. The West range has far fewer windows than the East. Possibly because the higher ground to the West made it more vulnerable to attack. Or possibly because this is where most of the servants were lodged. The South West tower (right) is attached to the kitchen and contains the well and a dovecote. The circuit is complete. As you look back at the castle you see the bungalow that Curzon built for his museum and a custodian. Behind the bungalow is a vineyard and above that an earth platform (not part of the NT castle grounds). This used to be called the Gun Garden but is now described as a pleasance – a place to view the beautiful castle. It was thought that this had been created in the late 16th or early 17th century but archaeological excavation suggests a medieval origin – perhaps created at the same time as the castle. 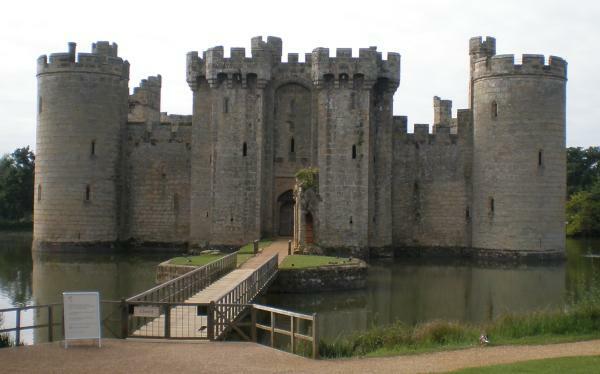 It seems that Bodiam Castle was conceived of as a place to view and admire from the very start. 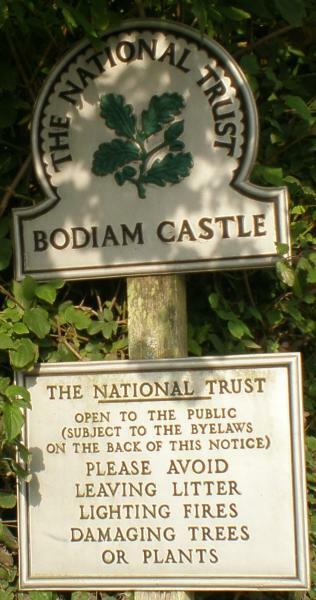 Posted on September 3, 2011, in Bodiam Castle, Sussex. Bookmark the permalink. Leave a comment.